A new survey from Constant Contact®, Inc. (NASDAQ: CTCT) indicates that social media marketing has surged to be a top contender in the SMB marketing tool kit! 73% of SMBs report using social media to market their business, and this appears to be a growing trend. Of those who are not currently using social media marketing, 62% expect to begin using social media marketing in the coming year. Further, 81% of those currently using social media marketing expect to increase their efforts this year. The survey also reports that SMBs still rely heavily on email, website, and event marketing, as well as advertising, to drive business. Despite feeling generally positive about 2011 revenues, SMBs reported business and financial challenges, including attracting new customers, getting current customers to refer business, and having the cash flow to run their business effectively. Of those doing social media marketing, 80% reported increasing their use in the past year. Among social media tools, Facebook® is the tool of choice for SMBs: 95% of those using social media marketing reported using the tool and 82% of those found it to be effective. Of note, in Constant Contact’s October 2010 survey, only 63% reported that Facebook was an important tool for marketing their business, and in April 2010, only 51% reported the same thing. SMBs found varying degrees of success with other social media marketing tools. Forty-seven percent of those using Twitter® found it effective, 47% of those using LinkedIn® found it effective, and 73% of those using video sharing tools, like YouTube® or Vimeo®, found them effective. With social media efforts growing, there has been no decline in the use of other marketing tools. 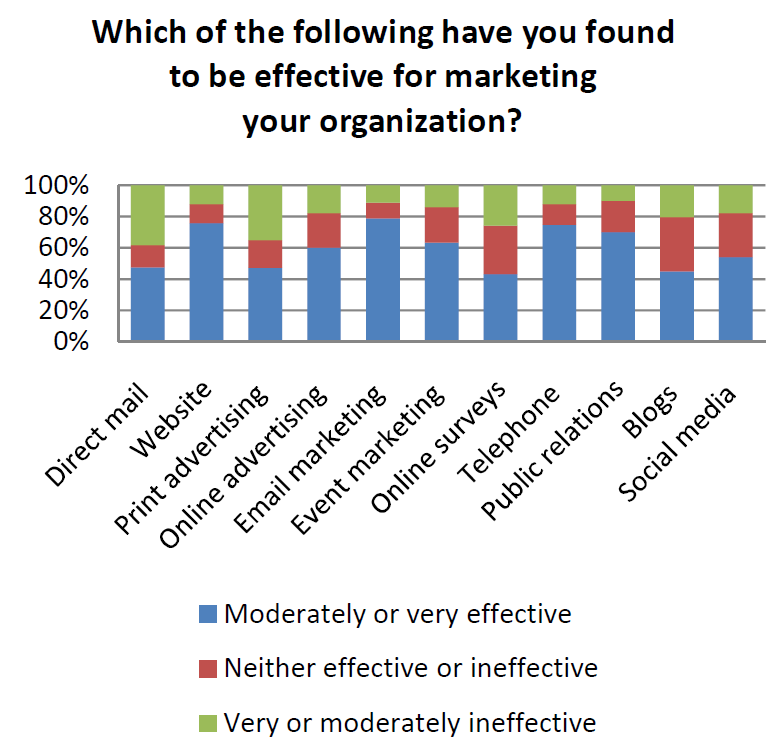 The survey found that 91% of SMBs use email marketing, 95% use website marketing, 77% use print advertising, 69% use online advertising, and 53% use event marketing. These findings suggest that social media marketing is complementary and additive, rather than a replacement to more “traditional” marketing methods. Respondents also reported that email is the first – and most frequent – tool that SMBs turn to when trying to connect with current and prospective customers. Eighty-three percent report that email is the first tool they check when going online for their business each day and 72% check their email six or more times a day. In comparison, 13% check Facebook, 6% check news sites, and 4% check Twitter more than six times per day. Survey respondents also weighed in on their economic outlook. 2010 was a positive story, with 53% reporting an increase in revenues and another 24% reporting that revenues remained flat for the year. Further, SMBs appear confident that an economic recovery is here, with more than 80% reporting expectations that revenues will increase in 2011. Economic challenges continue to come in the form of rising costs. Sixty-seven percent report that cost of goods has increased, while 58% cite overhead, 55% cite insurance, and 53% cite payroll as costs that have increased. Further, only 52% of SMBs say they have adequate cash flow to run their business effectively. SMBs also have business challenges. 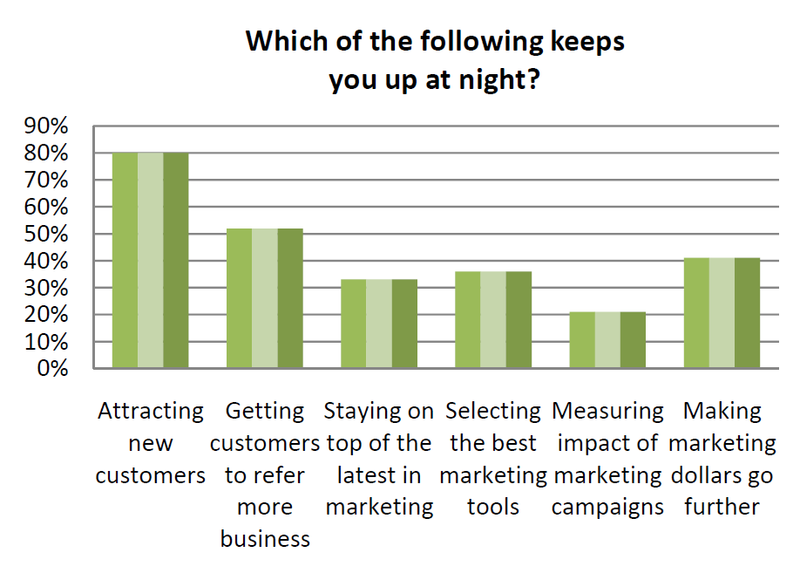 Eighty percent of small businesses reported that attracting new customers “kept them up at night.” Respondents also cited getting current customers to refer new business (52%) and making marketing dollars go further (41%) as top challenges. This Constant Contact-sponsored survey was administered during March and April 2011 to SMB owners and employees. Results include responses from 1,572 organizations across a range of business-to-business and business-to-consumer industries. Of note, 87% of these organizations have 25 or less employees.